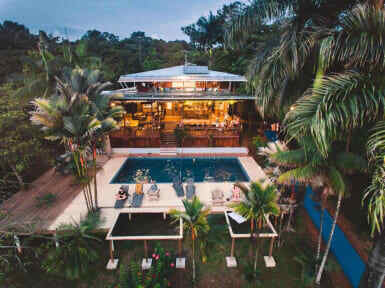 Bambuda Lodge is the only place in Bocas with a waterfront location and a massive pool. Only 5 minutes from town, Bambuda offers the perfect blend of good vibrations and chilled out atmosphere. We have a coral reef for snorkelling and acres of lush jungle for exploring. Our on-site bar and restaurant will keep the cold drinks flowing while you relax by the pool. Spend time in one of our many interesting hang out spots where you can enjoy the amazing view and the delicious food with friends. We can organize any and all of the available activities in the surrounding area. Tours and excursions can be booked with a simple phone call and many of the companies will pick you up and drop you off right from Bambuda Lodge. We will gladly explain everything you need to know about the area, and which activities will best suit you, depending on your interests. You can have an action packed vacation on any budget. Our property is covered by lush natural rainforest with 30 different kinds of fruit trees growing. Behind the hotel you will find miles of available hiking in our own private jungle. Around the house you will find mango, lemon, pineapple, bananas, bread fruit and several other tropical fruits growing.Directly off the dock we have a coral reef teeming with marine life. Borrow our snorkelling gear or rent our kayaks or pirate island and go exploring! Cancellation policy: 72 h before arrival. In case of a late cancellation or No Show, you will be charged for your entire stay. We do not allow children under age 16 at the Lodge. Payment upon checkout by cash or credit card (3% fee). Loved everything about it. The atmosphere, how it looked, the super nice staff! Only thing is that it's not the cheapest option since getting to the main island costs you a $5 water taxi and there's no common kitchen to prepare your own meals. Still worth it to me tough. one of the best hostels I'e been to on my trip. great location with great facilities (swimming pool, slide, good chill area, bar, kitchen). Renting things like snorkling sets, kayak's etc. is clearly cheaper than any other hostel in Bocas. This compensates nicely the money you spent on food there. As there is no communal kitchen, it is recommended to take food from the hostel. Prices are reasonable and especially dinner is just high-class cuisine. super friendly staff! thanks Tom and co! Super hostel, good atmosphere and amazing place to stay. Nothing wrong with it, the only thing you could say is that food prices are relatively high. But the food is amazing, so good value for money! Een geweldige sfeer en heerlijk eten ! Bambuda Lodge is like a dream. It's definitely one of the prettiest hostels I've ever seen. The staff is very friendly, the beds are comfy and the pool is outstanding. And then I haven't even mentioned the food. The idea of a family dinner is great, since it's a perfect way to meet people. The only downside is that hopping between the islands of Bocas del Toro isn't super cheap, so you end up spending quite a lot. But the stay is surely worth it. Please dont go here, its outdated and super overpriced. You can only have the food that they offer and everything I had was cold or not even tasty. The staff is unfriendly and not helpfull at all. And the rooms smell sooo bad! Showers and pool are nice though.